The total reported catch in 2004 of highly migratory species is 5.1 million tonnes dominated by catches of tuna and tuna-like species. Fisheries for highly migratory species are important in all oceans and semi-enclosed seas, except for Polar Regions. Fisheries for straddling fish stocks are much more localized, primarily occurring in a few regions where continental shelves extend beyond the 200-m EEZ limit or where the high productivity of the coastal area favour an expanded distribution of coastal stocks into the high seas, or attracts high seas resources into the EEZ. Most of the species that form straddling stocks, also form fish stocks entirely located within EEZs, and some of them may also make up high seas fish stocks. Almost certainly, most of the catch of species that constitute straddling stocks is taken within EEZs, probably mostly from stocks that are not straddling. The Atlantic cod, for example, constitutes a straddling stock species, but most cod stocks are not straddling. Therefore, in the absence of detailed information on the geographical location of the catch, it is not meaningful to report on the total catch of species that form straddling stocks, and there is insufficient data to report on the catch of these species solely for stocks that are straddling. Most fisheries for high seas fish stocks are deep-water fisheries conducted at depths of the order of 1 000 m, or more. The total catch from deep-water species (including species that are more likely to form straddling stocks, such as blue whiting) has increased steeply since the mid-1990s and it was 3.8 million tonnes in 2004, but the recent increase is largely due to blue whiting catches in the Northeast Atlantic. If blue whiting is excluded, catches from deep-water species that are likely to form high seas fish stocks peaked at 1.75 million tonnes in 1998 and have since declined to 1.4 million tonnes in 2004. There is also insufficient data in global databases to distinguish catches from deepwater fisheries or for purely high seas fish stocks from those on straddling stocks or those on stocks entirely located in EEZs, unless highly speculative assumptions are made. Nevertheless, in the case of deep-water species and once blue whiting catches are excluded, a much higher proportion of the total catch is probably taken on the high seas than for species that occur as straddling stocks. The state of exploitation of the fishery resources considered in this report, when it is known, is summarized in Figure 59 and compared with the world overall, as reported in FAO (2005a). The state of exploitation is classified as underexploited (U), moderately exploited (M), fully exploited (F), overexploited (O), depleted (D) or recovering (R). Percentages are calculated for stocks for which the state of exploitation can be determined. It is unknown for 73 percent of the stocks considered in this report. For highly migratory tuna and tuna-like species, 30 percent of the stocks are either overexploited or depleted. About 50 percent of the stocks are fully exploited (i.e. near their level of maximum productivity) and exploitation could be increased for about 20 percent of them as they are moderately exploited. The state of exploitation of tuna and tuna-like stocks is very similar to that of the world overall. The state of highly migratory oceanic sharks appears more problematic with more than half of the stocks listed as overexploited or depleted. 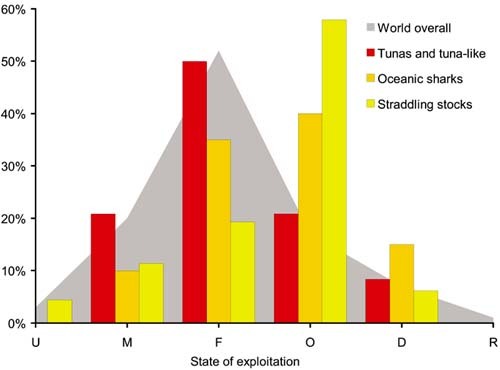 The state of exploitation for straddling stocks (including high seas fish stocks) is even more problematic than for highly migratory species, with nearly two thirds of the stocks for which the state of exploitation can be determined being classified as overexploited or depleted. In part, this reflects some well-known overexploited and depleted straddling stocks, such as cod stocks of Newfoundland, Canada, that have not recovered after more than a decade of stringent fisheries management measures. It also reflects several deep-water fisheries for species that are known to be vulnerable to overexploitation and depletion, at least locally. However, information on these deepwater fisheries is inadequate to determine the state of exploitation reliably in most cases. Also, it should be understood that information on the state of exploitation for straddling fish stocks and high seas fish stocks is a mixture of information relating to high seas fisheries and EEZ fisheries. The overexploitation and depletion of stocks of these species is not necessarily due to fishing on the high seas. The analysis of the state of fisheries based on catch trends (rather than stock assessments), described in the previous section, indicates that fisheries for epipelagic species (including most highly migratory species) began developing in the 1950s. By the late-1950s, more than half of the fisheries for these species had evolved to at least a mature stage of development. At present, about 70 percent of the fisheries appear as mature or senescent. This conclusion tends to give a less grim picture than the conclusions above based on stock assessments for tuna and tuna-like stocks (79 percent of which appear fully exploited, overexploited or depleted) and oceanic sharks (90 percent of which are fully exploited, overfished or depleted). For oceanic deep-water species, catch trends indicate that the development was somewhat slower than for epipelagic species with more than 50 percent reaching the mature stage or beyond by the early-1960s. At present, 70 percent of the fisheries for oceanic deep-water species have evolved to at least a mature stage, including more than 40 percent which are senescent. 1. What are the best estimates of the state (and trends) of the stocks that are likely to benefit from an effective application of the FSA? 2. How does that state (and the underlying trends) compare with those in fisheries that are solely under coastal State jurisdiction? 3. How well do high seas stocks not explicitly covered by the FSA compare with highy migratory species and straddling stocks? 4. Are associated species afforded adequate protection under the FSA? 5. Ultimately, how much added value, in terms of societal objectives (including ecosystem considerations), has resulted from the FSA, and how might it be increased in the future? However, the ability to answer these questions is seriously impeded by two key factors: (1) limitations of available data, and (2) the short time since the FSA came into force. These factors are examined below. There is no global dataset allowing the catch from straddling and high seas stocks to be separated from catch from EEZ stocks of the same species. Separating information on the state and trends of stocks can be even more difficult. Comparing the state and trends of stocks occurring partially or totally in the high seas with comparable stocks located entirely in areas under national jurisdiction may give some indication of the performance of management under the FSA relative to that under national jurisdiction. Real differences, if any, are likely to be masked, however, by uncertainty in the assessments in both the EEZs and the high seas as well as by interference of pollution and other environmental degradations mostly affecting the EEZs. Comparing the effects of conventional fisheries for groundfishes, mostly within EEZs (Christensen et al., 2003) with others mostly on highly migratory species (Myers and Worm, 2003; Baum and Myers, 2004) might provide some insight in the matter. However, the shortcomings found in the later studies by experts on highly migratory species (Burgess et al., 2005) have already been mentioned, and it is also noted that the exclusion of large-scale fisheries for herring and mackerel in the analysis of the effect of fisheries within EEZs exagerates the declines in commercially important species. There may be a tendency for scientists to be particularly precautionary in concluding on the state of species such as sharks or turtles because their life history makes them particularly vulnerable to overexploitation and depletion. Poor knowledge of stock structure may also distort the assessments in various ways. For example, a local fishery deemed to be overexploited may be exploiting a stock distributed over a much larger area, which is not overexploited over its entire range. Conversely, catches may appear sustained, only because aggregations of multiple stocks and sequential exploitation of separate stock units hides the sequential depletion. It would be difficult to conduct a meaningful assessment of the full impact of the FSA without social and economic information, the scarcity of which, already well known in EEZs can hardly be overstated in the case of the high seas. The figures contained in this report (percentage of stocks in various states of exploitation), in addition to the limitations indicated above, relate only to a proportion of the overall "universe" of stocks concerned, of which they are not a statistically representative sample. Read with their caveats, the figures are indeed, part of the "best scientific information available". Nonetheless, no matter how cautiously and clearly the statements are crafted, they may be used by the media and understood by the unaware readers as representing a comprehensive and accurate "truth". We know that this is not the case. For instance, in the Indian Ocean, on numerous unexploited seamounts, as well as in deep areas of the Mediterranean beyond 1 000 m (hardly exploited in the past and now banned to trawling by GFCM) there are hundreds of deep-sea/high-sea stocks of unknown size, in virgin state, and they are not accounted for in this report. Conversely, there are stocks that have been likely depleted, e.g. on seamounts, since the early days of deep-sea fishing of which we have no knowledge. There are also, most likely, stocks of associated species significantly affected by high seas fishing to an unknown extent. Even if the data limitations described above did not exist, one would not reasonably expect a measurable resource response in the brief time elapsed since the FSA was adopted by the Conference parties in late 1996, and all the more since it entered into force in 2001. It takes time to establish new regional fishery management organizations (a key element of the Agreement) where they do not exist. Translating conceptual objectives and strategic approaches embodied in the Agreement (such as the precautionary approach) into operational protocols, developing global databases, monitoring systems, and adequate national instruments to assist the flag State and port State in facing their responsibility also demands time and resources. Most importantly, stocks do not respond instantly to new conservation measures. For fish stocks that have been overexploited and depleted, the recovery process follows a sequence of regulations that effectively reduce fishing mortality, allowing more fish in the population to survive, grow and reproduce, producing more abundant future generations (environmental conditions permitting). Inevitably, the biological process takes at least a generation or more. The human process may take even more considering the lifespan of the vessels concerned and the rate of capacity-building in many developing countries. As a consequence, rebuilding periods of one or many decades (for very long-lived fish) are to be expected. In some cases, changes in ecosystems not within the scope of the FSA might also significantly delay or even prevent recovery. The slow recovery of several straddling fish stocks in the northwest Atlantic after more than 10 years of very stringent fishery limitations illustrates the intergenerational nature of the rebuilding process and the potential importance of ecosystem changes. In light of these factors, evaluation of the performance of the FSA might focus, as a first stage, on actions taken to ratify and implement the provisions of the Agreement, as necessary steps towards improvements in fisheries and fish stocks. Ultimately, these actions should lead to the long-term conservation and sustainable use of these stocks, which is the objective of the Agreement. With better data and the passing of time, future evaluations should then focus more directly on the concrete outcomes of these actions and assess whether fisheries and fish stocks are better off. During the last decade, since the FAO Code of Conduct for Responsible Fisheries (FAO, 1995) was agreed and since the Fish Stock Agreement was adopted by the UN Conference, many reports have been prepared describing actions that need to be taken to improve fisheries and the ecosystems upon which they depend. These include: FAO Strategies (e.g. to improve monitoring of fisheries status and trends), International Plans of Action, and Technical Guidelines (http://www.fao.org/fi/default.asp). A brief account of some key actions upon which good performance of the Fish Stocks Agreement could be predicated is given below, concluding with some comments on options for conservation and management of high seas fish stocks which are not explicitly subject to the FSA, and ongrowing public concern about fisheries. The key actions include improvements on the available information on stocks and fisheries, the application of the precautionary approach, reducing excess fishing capacity and implementing the ecosystem approach. 1. Misreporting - Ironically, fisheries management both depends on fisheries data and it creates an incentive to misreport it. Regulations that set a total allowable catch are notorious for creating an economic incentive for the fishing industry to misreport. While the design of reporting systems and enforcement can counterbalance the incentive for misreporting, for many fisheries it is a serious problem that is undermining scientific advice on fisheries management and the ability to monitor the state of fish stocks. For example, the annual report (http://www.ices.dk/advice/icesadvice.asp) of the Advisory Committee on Fisheries Management (ACFM) of the International Council for Exploration of the Sea (ICES) points out numerous times uncertainty in scientific advice for fisheries of the Northeast Atlantic resulting from concerns about the quality of fisheries data. The report for cod off Ireland is a particularly good example of types of concern about the quality of fisheries data (http://www.ices.dk/committe/acfm/comwork/report/2005/oct/cod-iris.pdf). The problem of misreporting is so severe for deepwater fisheries (many of which are straddling stocks or high seas fish stocks) that ACFM concluded that "it is currently not possible to provide advice for specific fisheries for deep-sea species". The occurrence of misreporting in Europe is common knowledge routinely receiving attention in the popular media. European Union Commissioner, Joe Borg, highlighted the serious nature of the problem of non-compliance related misreporting of catches stating that "Failure to enforce fisheries measures works against the interests of fishermen as it leads to overfishing, depleted fish stocks, smaller catches and shrinking income". An example of media interest in the problem of misreporting, including Commissioner Borg's statement is provided in: http://www.enn.com/today.html?id=9707. Misreporting is not unique to European fisheries. A Canadian government report (http://www.dfompo. gc.ca/media/backgrou/2003/nafo_e.htm) addresses it for the NAFO area in the northwest Atlantic. Misreporting of catches from the Southern Ocean area of CCAMLR has also been reported (http://www.asoc.org/Documents/XXIIICCAMLR/ASOCIllegaltoothfishtradepap.pdf). 2. Important types of data are not collected - For straddling stocks, highly migratory fish stocks, and high seas fish stocks, three key types of fisheries data are lacking for many, if not most, fisheries. One is data on discards. As discussed earlier in this report, mortality from discarding is substantial in tonnage, and it can seriously impact some stocks and species. In some cases, the impact is on species of no interest to fisheries, but there is significant societal concern about some of them (such as marine mammals, deep-water corals, sea turtles, sea birds). Some of these species are endangered. Lack of reliable data on discards probably means that some serious impacts of fishing are overlooked, and conversely, critics of fisheries may suspect or assert that impacts are more serious than they really are. Reliable data is needed to focus attention on the most critical discard issues. A second type of data on fisheries that is rarely collected in a systematic and comprehensive manner is data on social and economic aspects of fisheries. The purpose of fisheries is to generate net benefits for society. Typically, society is interested in revenues, profits, employment, food security, and how these benefits are distributed. Managers are often challenged by difficult conservation decisions in the face of concerns about adverse impact on benefits (particularly in the short term). Yet, they typically have to make such decisions without the benefit of scientific analyses based on reliable social and economic data. Similarly, at the policy level, long-term strategies for fisheries would benefit from social and economic data. The need to collect social and economic data is further supported by the fact that the modern concept of sustainability is understood to be multidimensional, with at least bio-ecological, economic, social and institutional components (FAO, 2002a). Some of the past failures of fishery management can be linked to not taking into account the human reactions to the management measures adopted and how they were applied. Many human reactions could have been anticipated if appropriate input from the social sciences had been included in the decision-making process. The third type of data that is difficult to obtain is data on product flow. What happens to fish that are caught in a particular fishery? What is the source of fish products sold in particular markets? Such data would not only be helpful to understand the distribution of benefits from fisheries, but it would greatly assist fishery managers to deal with Illegal, Unreported and Unregulated (IUU) catches, thus improving the quality of scientific information and enhancing compliance. Some Regional Fishery Management Organizations (e.g. ICCAT, CCAMLR, IOTC) have implemented their own tracking systems in an effort to cope with IUU. FAO recently reviewed experience with trade documentation schemes, including catch certification and catch demonstration (FAO, 2002b). Clearly, a comprehensive approach to tracking fish products would be more efficient and effective. It would also assist with public health concerns that exist for some fish products. 3. Data access and compatibility problems - Not withstanding the limitations noted above, it is common for potentially useful data to exist, but not available to scientists and managers that need it. Particularly for international fisheries that occur on the high seas, data is usually aggregated (in time, space, by gear type, etc.) before being reported to regional fisheries organizations and FAO. These databases are highly aggregated summaries of the actual data that is collected by national and local authorities. Thus, the statistics provided to FAO by its members, allow a distinction between long-distance and "domestic" fishing (i.e. within and close to the member EEZ) but does not allow to distinguish between catches in the EEZ and in the areas adjacent or close to it, i.e. on straddling stocks. There are also issues of compatibility between databases worth considering if new regional or global databases are to be created. Some of these problems could be solved by a new data management architecture of a hierarchy of linked national and regional databases rather than redundant databases of increasingly aggregated summaries at higher levels in the hierarchy. Many of the limitations of current programs for collection of fisheries data have a historical origin. Decades ago, before modern information technology, data collection, management and reporting requirements had to be simple and limited in the extent of data. Also, prior to widespread recognition of the vulnerability of marine fisheries to overexploitation and depletion, there was a reluctance to "burden" the fishing industry with reporting requirements. Lack of concern about conservation also fostered an implicit priority for protecting fisheries information that was asserted to be business sensitive at the expense of data needs for science and management. Today, access to fisheries resources should be understood to come with responsibility to provide the data that is needed for science based conservation and management. It is also suggested that it is time to rethink data collection, management and reporting programs for fisheries in light of modern information technology. In this regard, it is not enough to modernize technology for managing the data that has been traditionally collected. Old "taboos" on the types of data that could/should be collected need to be put aside. The FAO Strategy for Improving Information on the Status and Trends of Capture Fisheries (FAO, 2003a) can serve as the point of departure for reshaping data collection to match today's needs and opportunities. Of course, scientific assessments of the state of fish stocks and fisheries require more than fisheries data. Research on the biology and demographics of the fishery resources and their relationship to the ecosystems that contain them is also needed. Fishery independent surveys of resource abundance (e.g. statistically designed surveys with standardized fishing gear or acoustics, possibly conducted in cooperation with the fishing industry and other interested parties) are particularly important. For some demersal straddling stocks, such surveys are conducted, such as for straddling cod stocks within the management area of the Northwest Atlantic Fisheries Organization. However, the logistics of conducting resource surveys for many straddling stocks is difficult compared to surveys of more coastal stocks (typically in shallower water). Also, mixing of stocks when they are away from their breeding areas adds to the problem. Research on survey technology and design, as well as cooperation between fishing nations, could improve the situation. For highly migratory species, resource surveys are even more difficult than for straddling stocks, and such surveys are rare. The problem is that it is usually necessary to monitor vast areas, and there are few technology options available for doing so. Again, research on technology and design, and international cooperation, could help. For high seas fish stocks there is another scientific problem that must be overcome. Typically, fisheries for these resources exploit seasonal fish aggregations (e.g. on the peak of a seamount over a period of a few months). Little is known about the turnover rate of fish in these aggregations or how large a fraction of the total population they are. Their geographic range when they are off the fishing grounds is unknown. While it is tempting to assume that these fisheries are exploiting "discrete fish stocks" (a term used by the Fourth Informal Meeting of the States Parties to the FSA, 31 May - 3 June 2005, United Nations, New York), the relationship between aggregations (e.g. on nearby or even distant seamounts) is almost always unknown. In some cases, the high seas aggregations may be from the same stock as aggregations that are fished within EEZs, thus making them straddling stocks. For deep-water fisheries on aggregating species, the situation described above poses the following dilemma. Most deep-water species are long lived with low productivity, thus making them more vulnerable to overfishing. In fact, there is ample evidence that aggregations on localized fishing grounds are quickly depleted. However, there is no basis to judge the impact on stocks that exist over unkown geographic areas. Conducting the research necessary to determine stock structure and assess the state of stocks will be difficult and expensive for deep-water species that potentially occupy vast areas. Development of deep-water fisheries without such information is not consistent with the precautionary approach (discussed below), but are the fisheries worth the cost of the necessary research? Is the conservation worth its cost to society? New ways of acquiring the information to manage those fisheries sustainably and new economic accounting rules might be needed to accelerate the rate of progress. "in order to protect the environment, the precautionary approach shall be widely applied... Where there are threats of serious or irreversible damage, lack of full scientific certainty shall not be used as a reason for postponing cost-effective measures to prevent environmental degradation." appropriate placement of the burden of proof by adhering to the requirements above. Article 6 and Annex II of the FSA add specificity to the precautionary approach by calling for stock specific reference points and pre-agreement on actions to be taken if those reference points are violated (e.g. stock size too low or fishing mortality rate too high). Such reference points and pre-agreed actions are often expressed as "control rules" for fishery management, although not all harvest control rules are precautionary. The precautionary aspect depends on how the control rule performs relative to the risk of undesirable outcomes (based on the preponderance of evidence) and the severity of the outcomes. The FSA makes it clear that undesirable outcomes should be avoided. Article 6, paragraph 4 says that "States shall take measures to ensure that, when reference points are approached, they will not be exceeded." As reported in the UN Oceans Atlas (http://www.oceansatlas.com/world_fisheries_and_aquaculture/html/govern/capture/precappr/default.htm), the precautionary approach has been widely adopted by fisheries bodies including CCMALR, IPHC, IWC, ICES, NAFO, NASCO, ICCAT, MHLC, SEAFO, and it is being discussed by APFIC, WECAF and GFCM. It is also applied by several countries including the United States of America, Canada, Australia and South Africa. However, the approach is largely limited to biological aspects of fisheries. Application to other aspects of ecosystems and to the other components of sustainability have been less tangible. It is more difficult to formulate the equivalent of fishery control rules for ecosystems, although it is feasible to agree on actions to be taken if there are undesirable changes in ecosystems. As described above, the precautionary approach is at the forefront of current fishery management deliberations. However, the estimated risk taken relative to undesirable outcomes is not well documented for most fishery management decisions. If the actual risk is unknown, decisions must be made based on estimates of risk. Even if it were, managers may or may not have specified the risk that they consider precautionary. The acceptable risk is a management decision that should reflect the severity of the undesirable outcome. The actual degree to which the precautionary approach is being applied is difficult to assess. Historically, under open access conditions, fishing fleets have expanded far beyond the size needed to catch economically the available fishery resources. Restriction of fishing activity by catch limits, effort limits (such as days of fishing allowed), or by other measures have made fishing less efficient but they have not prevented the depletion of fishery resources. Even under strict management to protect the fishery resources, costs for fishing capacity (e.g. vessels) and other inputs to fishing (labour, fuel) are larger than necessary and potential economic benefits are wasted. Fisheries with marginal economic performance cannot absorb short term loses that inevitably become necessary to reduce catches to prevent overfishing, rebuild fish stocks, or to respond to a down turn in fish stocks due to natural variability. Thus, fishery managers are reluctant to reduce catches until there is overwhelming evidence that they must. The tendency to err on the side of short-term economic needs of fisheries instead of long-term conservation and sustainable fisheries leads to overexploitation and further depletion of fishery resources. This phenomenon helps to motivate the precautionary approach, which shifts decisions in the face of uncertainty with the view to improve the balance between development and conservation considerations, particularly when integrated in an ecosystem approach to fisheries. It is, however, much harder to make precautionary decision when there is overcapacity and precautionary decisions aiming at resources protection which do not solve the problem of poor economic performance and social disruption (often resulting in poor compliance) that result from excessive fishing capacity. Widespread recognition of the problem of excessive fishing capacity led FAO to adopt an International Plan of Action (IPOA) for the Management of Fishing Capacity (http://www.fao.org/figis/servlet/static?xml=CCRF_prog.xml&dom=org&xp_ nav=2,3). FAO (2000a) and WHAT (2000) and many other reports highlight the importance of allocating access rights to fisheries if fishing capacity is to match sustainable yields from fishery resources. Without rights, fishing vessels race to catch as large a share of the fishery resource as they can by investing in more and more fishing capacity until fisheries are no longer profitable. This phenomena is known as the "race for the fish." The theory indicates that when shares of the available fishery resource are allocated to participants in the fishery, their incentive changes from spending more to catch as much as possible to using the allocated share at the lowest possible cost. Schemes for allocating rights to shares in fisheries such as individual non-transferable or transferable quotas, and territorial use rights or TURF, have been implemented in many countries and are becoming increasingly common. While it is clear that rights-based allocation of shares in fisheries is a key element of managing fishing capacity, it is not clear that international organizations with responsibility for managing fishing on the high seas have the ability to allocate rights effectively. It is common for Regional Fisheries Management Organizations (RFMOs) to allocate shares of the total allowable catch to member countries. However, unless these countries further allocate their shares to individual fishing entities of their country, there remains an incentive among the national concerned to "race for the fish". In general, RFMOs have not attempted to influence national prerogatives on how they use their allocations. The implication is that those countries that do not remove incentives for the wasteful race for the fish are likely to be pressured by their fishing industry to reject the precautionary approach by giving their short-term economic interests priority over long-term conservation. RFMOs face another challenge in effective allocation of access rights to fisheries: the potential access by non-parties. Typically, RFMOs allocate all of the available shares of the catch to their members. However, non-members may enter into a race for the same fishery resources. Under the doctrine of freedom of the high seas, the potential number of fishing nations that might seek membership, expecting to be allocated a share of the catch is large. This creates de facto a potential "open access" to fisheries that can lead to an international race for the fish with negative consequences. According to the Fish Stocks Agreement, these countries should join the RFMO. The FSA calls on non-members of an RFMO to adhere to the RFMO's conservation measures, thus providing incentive to join so that they can participate in the fishery management decision making. However, countries will be reluctant to join unless they have a reasonable expectation that they will be allocated a share of the allowable catch. This means that existing shares must be reduced proportionately or the allowable catch must be increased (above the scientifically determined quota) to accommodate new members, ultimately devaluing shares in the future and perhaps placing the fishery resource in question at higher risk. "The purpose of an ecosystem approach to fisheries ... is to plan, develop and manage fisheries in a manner that addresses the multiple needs and desires of societies, without jeopardizing the options for future generations to benefit from the full range of goods and services provided by marine ecosystem." "An ecosystem approach to fisheries strives to balance diverse societal objectives, by taking into account the knowledge and uncertainties about biotic, abiotic and human components of ecosystems and their interactions and applying an integrated approach to fisheries within ecologically meaningful boundaries." In practice, an ecosystem approach must necessarily evolve from current approaches to fisheries management by taking account of diverse objectives from a broader group of stakeholders, based on increasing scientific information about relationships between fisheries and ecosystems, and applying new approaches to minimize adverse impacts. The EAF requires, inter alia, the adoption of the precautionary approach, matching fishing capacity to fishery resources potential, and improving information on fisheries, resources and ecosystems. There is much evidence that the evolution to an ecosystem approach is underway with precautionary control rules being implemented, new measures to reduce bycatch and habitat alteration from fishing gear, and more access to RFMO by non-governmental organizations representing diverse stakeholders. Undoubtedly, there is more application of an ecosystem approach today than there was five years ago, and there will be even greater application five years from now. However, this does not mean that all stakeholder's interests and values are being given adequate consideration, that all relevant scientific information is being taken into account, and that managers are properly balancing risk in the short and long term. Since ecosystem objectives reflect compromises between diverse, and sometimes conflicting, human values and are not uniquely determined by science, the ecosystem approach requires a degree of subjectivity and the degree to which it is being applied is largely "in the eye of the beholder." Straddling fish stocks and highly migratory fish stocks are clearly subject to the United Nations Fish Stocks Agreement, but the applicability of the Agreement to the typical high seas fish stocks (i.e. located entirely in the high seas) is being debated. Without the intent to enter into this debate, comments on some approaches that might be used to put in place conservation and management regimes for these stocks will be made below. Leaving these other high seas fishery resources (the high seas fish stocks) unmanaged would not be consistent with the precautionary approach. The FAO Guideline's address this point explicitly by stating "all fishing activities must have prior management authorization ...". Leaving these fisheries unregulated is particularly a problem because their low productivity makes them especially vulnerable to overfishing and associated ecosystems are known to be fragile. A straightforward approach is for the countries fishing these high seas fish stocks to negotiate an agreement for new regional fishery organizations to cover these resources. Alternatively, a global agreement might be negotiated to cover all deep-water (generally seamount) fisheries that are not subject to any other competent management authority. However, negotiating new fishery management agreements would be a difficult, time consuming process. Furthermore, if countries interpret the UN Fish Stocks Agreement as not applying to these other high seas fishery resources (i.e. the high seas fish stocks), they will not feel compelled to join new fishery management organizations or adhere to their conservation measures. It is noted, however, that the relationship between high seas fish stocks and stocks of the same species fished within EEZs is unknown in most cases. The possibility that some of these stocks may exchange genetic material, operating de facto as "straddling stocks", cannot be ruled out a priori. "No Party shall authorize any fishing vessel entitled to fly its flag to be used for fishing on the high seas unless the Party is satisfied that it is able, taking into account the links that exist between it and the fishing vessel concerned, to exercise effectively its responsibilities under this Agreement in respect of that fishing vessel." "Apply a precautionary approach widely to conservation, management and exploitation of living aquatic resources in order to protect them and preserve the aquatic environment, taking account of the best scientific evidence available. The absence of adequate scientific information should not be used as a reason for postponing or failing to take measures to conserve target species, associated or dependent species and non-target species and their environment". The Code of Conduct also calls for prior assessment of the potential impact of new fisheries or introduction of new technologies including prior impact assessments (sections 8.4.7 and 12.11) and the adoption of cautious measures for new fisheries (section 7.5.4). It can be argued that a Nation that allows a vessel flying its flag to fish without being subject to a conservation regime that can reasonably be expected to conserve vulnerable fishery resources and ecosystems, is not fulfilling the spirit of the Compliance Agreement and the Code of Conduct. As an alternative, such Nation could licence vessels flying their flag to only fish in areas subject to (and complying with) appropriate conservation measures such as those agreed by a competent Regional Fisheries Management Organization. When no such organization exist, such Nation might give the authority to fish subject to a prior impact assessment leading to a cautious fishery development plan with adequate monitoring and research. Of course, such unilateral action by individual fishing Nations would be undermined by Nations acting irresponsibly. Another approach that is being actively considered by parties to the Convention on Biodiversity (http://www.biodiv.org) is to establish Marine Protected Areas (MPAs), including areas where fisheries for high seas fish stocks or for more general high seas fishery resources do or could occur. The issue is still open. The United Nations is also considering the option of high Seas MPAs. The validity of this approach partially depends on the intent of the MPAs. If the MPAs are intended to be part of a broad strategy to protect biodiversity, then they would seem to be consistent with the intent of the Convention on Biodiversity. If the intent is specifically to regulate fisheries, then international instruments specifically designed to manage fisheries would be a more appropriate option. However, the boundary between objectives of fisheries management and biodiversity conservation are not sharp, and biodiversity concerns are likely to gain more momentum if widely agreed fishery management norms for responsible fisheries such as those embraced by the Code of Conduct are not fulfilled. For instance, a moratorium on deep-sea bottom trawling has been proposed as an option until adequate conservation measures can be adopted in the high seas, during the United Nations Open-Ended Informal Consultative Process on the Law of the Sea in 2005. Again, this approach is likely to gain momentum if fishery management is deemed to fall short of agreed norms and practices. Clearly, management of high seas fish stocks has a high profile with international policy makers, as evidenced by the attention of the General Assembly of the United Nations. While it is important to manage these fisheries responsibly, it is also appropriate to put them in perspective. Most fishing is within EEZs, and most high seas fishing is subject to the United Nations Fish Stocks Agreement. On the one hand, fisheries for high seas fish stocks (i.e. those entirely in the high seas) account for a fraction of a percent of catch, revenues and fishing vessels and only a few countries participate in these fisheries. While the habitat impact of these fisheries might be locally intense, the fraction of the seafloor impacted is infinitesimally small. On the other hand, most fishing people are engaged in small-scale coastal fisheries. They impact coastal ecosystems virtually everywhere, except perhaps in polar regions. Legitimate concerns about high seas fish stocks and other fishery resources exploited in the high seas should therefore not divert attention from the serious situation of stocks in EEZs and the efforts required to apply the Code of Conduct to fish stocks and fisheries that need urgent attention, giving particular consideration to small-scale coastal fisheries upon which millions of people are critically dependent. During the last decade, world fisheries have received increasing media attention carrying a largely negative image of the sector. Considering the poor state of many of the world resources and fisheries, the recurrent economic crises in the sector and the few but notorious stock collapses, such a negative image is understandable in a global context of growing societal concern for the ecosystem. Because of the tendency of the media and advocates to dramatize the news and events, the public perception is probably worse than the reality. Regardless, public perceptions influence both politicians and the market. Moreover, a negative public image of some fisheries threatens all fisheries, even those which are conducted responsibly. Through the analyses it conducts and publishes and with the support of organized press coverage, the scientific community has actively participated to public awarenessraising, contributing to the negative trend in public opinion. A growing number of scientists also contribute to advocacy, boosted by the increasing financial and media support from environmental non-Governmental Organizations (NGOs), enhancing further the public awareness of problems. FAO, as the only global inter-governmental body for fisheries has informed fisheries development and management since the 1960s, establishing the concept of science-based decision in regional fishery commissions. It has significantly contributed to the global scientific and management infrastructures and capacity, particularly in the developing world, since the 1970s, contributing actively to the UNCLOS process. Since the early-1980s, it participated actively in the raising of environmental conscience, e.g. through the UNCED process, contributing in particular to the elaboration of Chapter 17 of Agenda 21 on oceans and coastal areas. The adoption of the Code of Conduct for Responsible Fisheries enshrined the notion of "responsibility" in fisheries (with its corollaries of accountability and liability), providing the opportunity of a strong interaction with the process of elaboration of the the United Nations Fish Stock Agreement. The FAO monitoring, analyses, and strong communication about the disturbing state of world fishery resources, the role of overcapacity and subsidies, and the weaknesses in national and regional fisheries governance, have not only contributed to but often triggered policy-makers and public attention, and has done so in a more balanced manner, perhaps more than less institutional advocates. The scientific community and FAO have a duty of informing. Divergences between scientists in areas where uncertainty is high are unavoidable and healthy but they must be resolved for decision to proceed. There is growing concern about the real efficiency of peer reviewing in scientific journals, as well as about the connections of some journals with the private sector, the NGOs or the media and about the consequences on objectivity. There is also concern about the relative lack of formal "professionalization" of the function of fisheries expert which, contrary to the rule in medicine, law or engineering professions, are not governed by corporate forms and norms of governance that can assure the policy-makers and the public that the advice they hear comes from experts with certified competence and practical experience. Ultimately, the public deserves to be able to distinguish members of the discipline giving neutral advice of quality, from those advocating for their client, their sponsors or their own values. Advocates have a societal role to play but the danger is in the confusion of the scientific and advocacy roles. The arena of the high sea/deep-sea resources is one in which the problems addressed above are particularly active. As this paper illustrates, there are good reasons for that: (1) Information is inadequate; (2) Resources and habitats are particularly vulnerable; (3) Governance frameworks are imperfect, characterized by weak flag and port State action, flags of convenience, lack of enforcement power and scarcity of performance assessments of RFMOs, etc. It is therefore an area where risk is high and all the mechanisms mentioned above are at play. Under such circumstances, it is of utmost importance to start showing positive signs in order to influence public opinion positively accepting the fact that many environmental NGOs and "professional" scientific advocates will be more motivated in convincing their constituency than in demonstrating facts and in describing problems than progress. Progress should become rapidly measurable in institutional terms (adoption of key instruments, mainstreaming them at regional and national levels, etc.) as well as in terms of outcomes with respect to stocks and ecosystem rebuilding.